360 photos and videos could bring great benefit to businesses within all sectors. For businesses with brick-and-mortar establishments, it is important that your customers are easily able to locate your store, especially if your location is tucked away in a corner or hidden among similar looking buildings. Estate agents could use 360 photos to demonstrate their properties. Travel industry business owners can showcase their accomodations and scenic views. Manufacturing businesses can feature their production lines to showcase their new infrastructure or provide some insight into how their products are made. When prospective customers seek you out on Google Maps, 360 photo helps ensure that their first encounters are great ones. Invite customers in with indoor view of your business on Google Search and Google Maps. 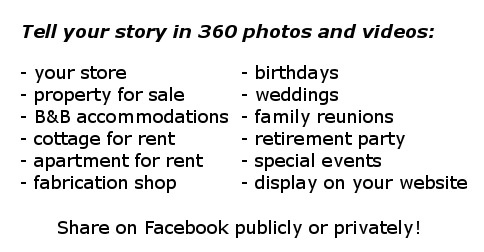 Please contact me if you need asistance with your 360 photos.